For Whom the Bell Tolls is a 1943 film in Technicolor based on the novel of the same name by Ernest Hemingway. 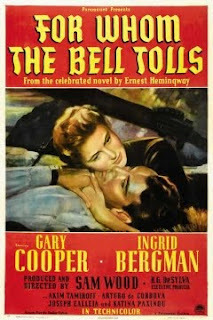 It stars Gary Cooper, Ingrid Bergman, Akim Tamiroff and Katina Paxinou. This was Ingrid Bergman's first technicolor film. Hemingway handpicked Cooper and Bergman for their roles. The film was adapted for the screen by Dudley Nichols and was directed by Sam Wood. The film became the top box-office hit of 1943, grossing $11 million. It was also nominated for nine Academy Awards, winning one.